Court Yard Hounds is an American country music and folk duo, founded by sisters Martie Maguire and Emily Robison. Building on the success of their self-titled 2010 debut, after the Dixie Chicks went on hiatus following a five-Grammy triumph in 2007, the two sisters were ready to get back into the studio. Their newest album, Amelita, was released on July 16th and has a country-pop, folk sound that will keep you singing all summer long. 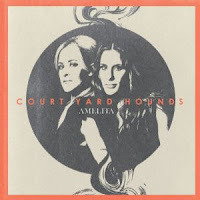 Containing 11 new tracks, Robison and Maguire took a different approach with Amelita than their debut album in 2010. This album contains a new perspective, which is due in part to time passed since Robison’s divorce. “I’ve been freed of all of those time-heals-everything kind of things,” says Robison. “Now, I’ve opened up to other ideas and ways of looking at life and the world. I think it’s not only a more hopeful album, but it’s more… well fun." My favorite track on the album is The World Smiles which is a song about keeping your head up and having a positive attitude even when others try to bring you down. With lines like "If I believe in the good stuff and open my eyes up, The world smiles," it's hard not to feel positive and content when listening to this song. Amelita is an album that anyone will enjoy. Check it out, and enjoy the music! Disclaimer: I participated in this campaign for One2One Network. I received a free copy of the CD to facilitate my review. By posting, I am eligible for incentives. All opinions stated are my own.